Free and active, elbows fitting close to sides, neither loose nor tied. 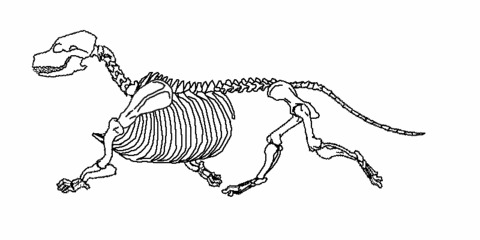 Forelegs reaching well forward without too much lift, in unison with thrusting action of hind legs. FORM AND FUNCTION. Judges learning about breeds hear this familiar line over and over. The “Why“ of a breed – “why“ a breed is structured the way it is and how that structure is related to the purpose and breed function of getting a particular job done. A pretty, typey Cardigan is only a function of how that pretty, typey Cardigan moves to get the job done for which it was created. Cardigans were bred to work the rough terrain of mountainous Wales. A good Cardigan was invaluable to the farmer in driving the stock to market or to drive home after grazing. The Cardigan had to maintain a steady pace and work a long day and not tire out. They were efficient little power house machines getting the job done. The Cardigan does not work like the German Shepherd Dog, who were literally "moving fences", working along a particular line to control the flock. The Cardigan was originally a cattle dog rather than a sheep herding dog. They drive by barking, heeling and nosing - making short little runs back and forth at a full out gallop, forever dodging and nipping. Once the cattle is on the way in the right direction, he would fall back into a canter, or a trot. This is a working breed and as such it MUST be able to move freely and with stamina. A working dog that cannot move is not efficient and judges and breeders need to remember this. Every breed has been developed for a purpose - a guard dog to guard; a terrier to hunt vermin; a herding dog to work stock etc., so being able to move must be an essential part of a Cardigan Welsh Corgi's breed characteristics. If the dog has the correct structure as per the breed Standard then it follows that it will move well. The Cardigan should have a flexible and very strong back to be able to twist, turn, gallop, and a strong rear to propel the dog along all those twists and turns, and very strong forequarters to take the constant shock of all that movement. 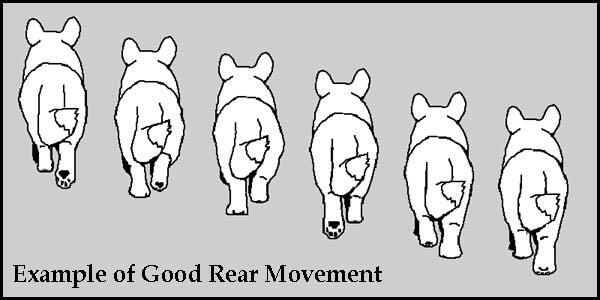 The US Standard states:“The hindquarters must denote sufficient power to propel this low, relatively heavy herding dog efficiently over rough terrain.” This power is generated in the rear and is conveyed by the spine to the front end. The front end controls the brakes and the steering of the dog. The length of stride of the forelegs must match the length of stride of the rear legs. Each front leg must be able to reach as far forward as each rear leg, as well as drive back and follow through to the same degree. The dog must posses a well angulated shoulder blade and upper arm, as well as a high, well muscled shoulder which gives leverage and sufficient muscling for effective rotation. 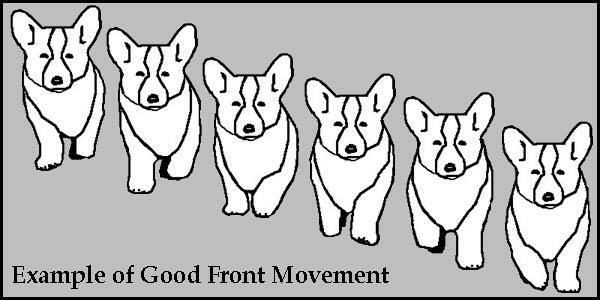 Both front and rear paws must strike the ground at the same angle. They must show the same amount of reach and the same degree of follow through. Cardigans should move just like any other breed of dog with respect to good reach from the shoulder, good drive and extension in the rear, a topline held level without rolling, and with the head slightly lowered. Cardigans should be shown on a loose lead, allowing them to bring that head forward and down. The loin must be short for it is the bridge linking the supportive rib cage to the hindquarters, and there is strength in a short bridge. The tail should drop, flowing behind and the dog will begin to drive from the rear. The well-angulated rear leg must move with strong drive in line with the front leg with the foreleg moving smoothly forward under the shoulder. There must be smooth movement at the stifle, hock and pastern which aid in absorbing the shock of movement. The pads of the paw should be seen as the dog goes away, without any noticeable weaving or extra movement at the hock joint. Cardigans cannot single track due to the shortness of the leg and deep chest but they tend to with legs that slightly converge towards the center line. The movement appears strong, smooth and effortless. US: Feet must travel parallel to the line of motion with no tendency to swing out, cross over, or interfere with each other. Short choppy movement, rolling or high-stepping gait, close or overly wide coming or going, are incorrect. The Cardigan breed as a whole needs to strive for correct structure to improve movement. There are few Cardigans shown today which possess a good front and good rear-angulation. Many of them are very straight in front and in the rear and they may have adequate movement but no reach in front or in the rear. Limited front reach that does not equal the rear extension may be caused by a short upper arm. A stuffy neck may indicate a steep shoulder and/or forward shoulder placement. This is evident either standing or in moving. Cardigans shown on tight leads will shift their weight to the rear and will move very stilted. Many exhibitors are running their dogs round the ring, not on a loose lead and it appears to be acceptable. Judges must have handlers move out on a loose lead and at a moderate trot. The breed does have some fine examples of correctly moving Cardigans and breeders need to learn from them and judges should spot them easily and will reward them. We must strive for good reach in front with drive and extension in the rear, a correct tail carriage for balance and a strong back with level topline. The term gait covers the pattern of footsteps at various rates of speed, each pattern distinguished by a particular rhythm and footfall. 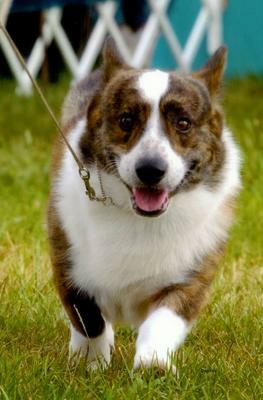 The walk, trot, canter and gallop are the most commonly recognized gaits in the Cardigan Welsh Corgi. The trot is the preferred gait in the show ring. The trot is a rhythmic two-beat, diagonal gait in which the feet at diagonal ends of the body strike the ground together. Because only two feet are touching the ground at a time, the dog must rely on forward momentum for balance. At a normal trot, when the weight is transferred from one pair of legs to the other, there is an almost imperceptible period of suspension as the body is propelled forward. The suspension, or flying trot, is a fast gait in which the forward thrust contributes to a longer and more obvious period of flight during each half stride. Because of the long reach, the hind feet actually step beyond the imprint on the ground left by the front foot. But the suspension, combined with coordination and good foot timing, is important to avoid interference. Dogs (and horses) can be trained to hold the trot at a speed where a canter or gallop would be more effecient in terms of energy expended. The canter is basically a slow form of gallop, and not as tiring. It has three beats per stride, where one foreleg and both hind legs move more or less together while the remaining foreleg or 'lead' leg moves seperately for reasons of maintaining balance while turning. The canter represents a gait that can be sustained easily over a long period of time. 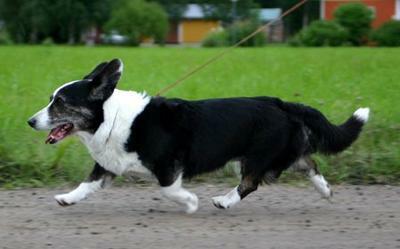 The canter is a characteristic gait of the Cardigan Corgi. The UK breed standard of 1933 under General appearance mentions "... a charming characterstic dancing gait to his canter such as may be seen in no other breed". 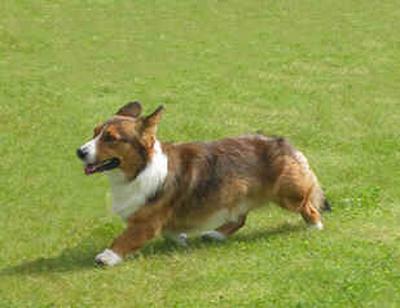 And in his article What The Modern Corgi Owes To Its Cardigan Ancestors, published in the American Kennel Gazette in 1935, W. Lloyd Thomas when describing the gait of the original Cardigan Corgi refers to a characteristic hopping action of the hind legs which always occurred when cantering. This action which is a highly dominant characteristic is difficult to describe but once seen can never be mistaken. The fastest movement of the dog, the gallop, is a four-time gait in which the dog is fully suspended or airborne once during each motion sequence. The actual movement pattern is right front foot, left front foot, right rear foot, left rear foot. Suspension occurs immediately after taking off from the left rear foot. The pace is not desired in the show ring and is merely mentioned to complete the picture. 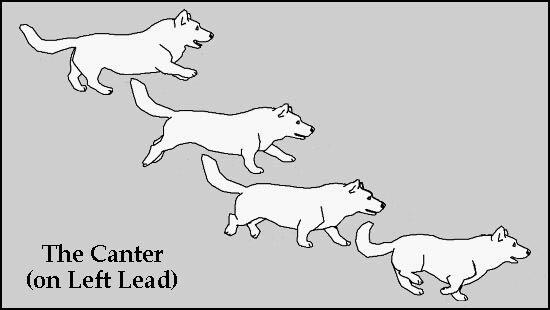 It is a two-beat lateral gait in which the legs on each side move back and forth exactly as a pair causing a rolling motion of the dog’s body. Structure and proportion (as well as fatigue) influence a dog’s inclination to pace. We hope to get a better video- example some time soon. Caught in the phase where he is moving over the right front leg, and beginning to swing the left front forwards. A picture a second or two later would have been better. Note that the paw on the ground is straight, while the paw lifting is slightly turned. Notice also the reaching forward. A nice free mover showing an unlevel topline, lots of front reach, good underreach and follow-through, head carriage is correct for a dog in motion.